Do you crave cake? Have a fancy for French macarons? Pine for pâtisserie? If you’re in the area of Hillsborough, NJ, are you ever in luck! Simply Sweets by Lauren is heaven in a baking pan. Lauren Warmke creates custom cakes and French macarons entirely from scratch, which makes her unique. It seems silly but I bake everything from Scratch, no boxes here ever. I tell clients this and they always say, “Well, doesn’t everyone?” The answer is no! Most bakers use a mix to cut corners, and focus on the decoration. Because I bake from scratch, I know that my Cakes and Treats taste as good as they look!!! In Lauren’s ‘previous life’, and before children, she worked as a massage therapist. It was a ‘cool’ job to have, but she didn’t feel that excited about it. Then, her first daughter was born, and another little girl came along a few years later. Lauren began baking cakes and treats for their birthdays. She loved to do it, and was certain she could turn her passion into a business. Now Lauren is full-time into Simply Sweets, and excited about being able to spend much more time with her girls. Plus, she’s getting set to open the doors to her NEW cake studio in about a month! Look for Simply Sweets by Lauren in the Triangle Shopping Center on Route 206 in Hillsborough, NJ. You will love getting a behind the scenes peek on Lauren’s Facebook page! I already had a Logo that I love, but I knew it didn’t speak to my ideal Client. And I knew the direction I wanted to go. With the help of the ladies at Autumn Lane, I was able to narrow down all the details. I know my new logo will help steer my business in the direction I see it going. This year I am excited to be able to expand, with private classes and retail that fits into my schedule. After all, that’s why I started this business in the first place – to spend more time with my daughters. Transitioning from employee to business owner can be a lonely journey. There’s so much to take in, all at once, and then you have figure out how to keep track of it. But think about how Lauren deals with confusion. The biggest obstacle for any business, I think, is finding your value and what you have to offer that sets you apart. I was able to find an amazing business mentor that also happens to be a caker. She has helped me learn how to convey the value of what I do. Define YOUR success, not by comparing yourself to someone else, but by how far you’ve come. That way, every day is a success. Lauren’s greatest success is how proud her girls are of her. What would qualify as succeeding, to you? Frankly, we think her succulent cupcakes would make the cut! Look for them on Instagram. It’s easy to get carried away with your passion and start a business. The hard part is sustaining a profitable business that can pay you what you are worth and grow at the same time! My advice to anyone starting a business is don’t be afraid of the numbers, as creatives we avoid the books, accounting and processes. Unfortunately, this is where business can fail, so do the work and become a BOSS at running your business. It’s not all Buttercream and Flowers all the time!! Are you hungry for your own branding? Contact our professional, creative design team. We can serve it up, just like you want! Delicious! When I was 30 years old, my husband and I were told I couldn’t have children (I’ll save you the details on how we got there). Primary infertility, a diagnosis that left our world shattered. Fast forward 7 years, when I am 37, and we find out we were pregnant with our son. He was born on 7/27 at 5:57 pm. He weighed 7 lbs. 11oz. and was perfect in every way. Notice a trend with the number 7? Plus, our family name is Anderson. What do you think of, when Montana is mentioned? Cowboys? Andie McDowell? Skiing? How about custom designed luxury note paper? Janeil Anderson’s studio, 7th & Anderson, is tucked away in the historic town of Laurel, Montana. Located in Yellowstone County in south central Montana, Laurel is close to Billings. And not far from Yellowstone National Park, if you remember that it’s not uncommon in the West to drive 100 miles to have dinner. 7th & Anderson offers wedding and fine stationery for those celebrating a big moment in life. The classic sophistication of Janeil’s creations is perfect for such special occasions. Customize every invitation in the Studio Collection to suit your individual style. Janeil’s love for paper started early. As a little girl, she spent hours with construction paper, glue, scissors and crayons. That led to a passion for scrapbooking, then handmade cards. At some point, frustrated with the lack of available designs for her projects, Janeil began designing her own. That grew into learning design software and teaching herself about typography. And then, into being privileged to be able to do something she loves every single day. Now full time in the business of 7th & Anderson, Janeil is also a licensed mental health therapist. Her career for the past 20 years has been working with abused and neglected children. She has maintained her licensure and continues to assist on occasion at the local psychiatric facility. Choose from 3 different printing processes – digital, letterpress and foil stamping. If you’ve ever felt the luxuriousness of true letterpress printing on quality paper, you know it’s exquisite. And Janeil has it! Add a classy self-adhesive wax seal in one of 10 gorgeous colors and a variety of designs. All wax seals are Artisan made in North America. And the details can be personalized. More options include hand torn edges, vellum jackets, envelope liners and professionally addressed envelopes. Janeil also offers Custom Design services, believing in the art of storytelling through the craft of paper and ink. Every detail must speak my client’s story, every color must emulate love, joy and hope. With a custom suite, they direct the design process and I bring their vision to life. Always, always research. Let your enthusiasm build the dream, but realize that the end result doesn’t magically appear. Janeil’s greatest obstacle was jumping in with two feet before doing any research. Then she had to backpedal, start over, realign and spend more money. It was a costly obstacle that I created for myself, and one I could have easily prevented if I had taken the time to research. So, I stopped the insanity and spent an entire year researching. I researched everything from business insurance, to website platforms, to wholesale providers to my local market. From there, I spent another year developing, revising and honing a plan. Which brings us to today. Take that first step from ‘something you do on occasion for that person you know’ to becoming a full time business. Realize that what you want is a series of first steps. Janeil took that first step into bridal fair, the first consultation, the first Instagram post, starting a Facebook page, and building a website. Everything – absolutely everything – starts with taking the first step. Don’t be afraid to take it. Oh, the website process. I have absolutely NO website design experience and had no real desire to try and learn, at least not on my initial build. There is enough going on without adding that to my plate. Lol. That being said, I learned a great deal throughout this process and am incredibly grateful for the patience, knowledge, and assistance of Jeff and Kate. Going back to the research thing, the first decision Janeil had to make was, which platform to use – Shopify, Squarespace or WordPress? Every time you turn around, another platform is being hyped as the best. So she did some ‘comparison shopping’ and settled on WordPress, for two reasons. First, it’s been around for quite some time and hosts the largest number of ecommerce sites on the internet. That means it’s reliable, and compatible with social media and other interfaces. Plus, it’s easy for clients to use, and relatively easy to learn as the website owner. Second, customization. 7th & Anderson needs to have its own look and feel. Janeil is a fan of individualty and wanted to be able to make the site her own. WordPress offers a host of customization options, and with the help of Jeff and Kate, the customization was taken a step further. Content. Yep. Content. That’s a big one. I am an incredibly visual person and I found it difficult to decide on an overall look, not only for a single page on my website, let alone the entire site itself. The website questionnaire utilized by Autumn Lane helped me to pinpoint what pages I would like to have. And from there they provided me with a website mockup based on this questionnaire. Once I saw the mockup, I could visually begin to put together my website, which included writing my content. I am exceedingly grateful that Autumn Lane didn’t require me to have all my content ready at the inception of my website build. Did that extend my website build process? Absolutely. However, their willingness to allow me to write my content as we built the website was invaluable to me. It allowed me to work in pieces rather than wholes. I didn’t feel as overwhelmed, and I could really put thought into what I wanted in real time. Much better than hoping it would all work prior to even beginning the website build. I am notorious for getting an idea stuck in my head and then hanging on to it with a death grip. One of the most difficult decisions I had to make required me to let go of how I wanted my pricing to work, so I could also have the look and personalization options I wanted in my shop pages. Through multiple, multiple emails and phone calls, Jeff patiently explained to me the limitations in what I was asking for and helped come up with a different solution. At the end of the day, I am quite happy with where we landed. Whether you’re a large or small business having a website presence is almost mandatory. When we are looking for something specific, we do a search on the internet. My couples favor quality over economy and are looking for an effortless timelessness to their wedding stationery. Not only is my website consistent with my brand voice, messaging and personality, it also helps differentiate me from similar companies. My website has taken my brand voice and made it visual. I believe the quality of the images/content are a direct representation of the quality product my couples expect (and should expect) from me. In the Billings area, look for amazing and wonderful things from 7th & Anderson! Janeil will continue to develop her online shop, adding new gorgeous and timeless wedding designs to the Studio Collection. Also she’ll add day-of paper goods as a standard option. That way, the amazing couples she works with can effortlessly create a cohesive look for their wedding stationery from start to finish. Montana is a destination state for many couples. With that in mind, Janeil will be adding a section of Montana specific designs to the Studio Collection. By the time her son starts Kindergarten (4 years from now), she wants an offsite studio. Not only to meet with couples, but also to offer the luxurious cardstocks and envelopes she uses to the DIY bride. This will lead naturally to a full letterpress print studio (letterpress is her FAVORITE). Couples will be able to come in and watch their wedding stationery get printed! Yes! And even help if they want! Janeil also intends to learn hand calligraphy, to offer this option to her couples. Plus, she’ll bring envelope addressing and envelope liner printing in house as well. On a personal note, Janeil is a runner, and will continue to run and train for marathons. She has a goal to qualify for and run the Boston Marathon. Spending time with family and friends – nothing brings greater joy than that. I am a firm believer that there is room for everyone (in any chosen profession) so don’t let the fear of a “saturated market” stop you! Figure out and decide what makes you different. What is it about your product that will make YOU stand out over the competition. Design what you love. Personally, my style leans towards the classic and refined, with just a touch of fun! I love adding little details you wouldn’t expect to see. And while I respect trends, I don’t rely on them. Understand, and be okay, with knowing you won’t be a fit for everyone – and that’s okay! It’s called a “target market” for a reason. Figure out who that is and market to them. Finally, develop relationships with the other amazing vendors (both local and not) in your field. Not only are they fabulous human beings to begin with, but it will offer amazing opportunities for collaborations. These days, every business needs to have a website. Ask us about the details of creating a responsive, mobile-friendly, gorgeous custom platform for you! Photography has always been a hobby of mine, and after my dad passed, it reignited my interest because he was an amateur photographer. He left behind over 2,000 photos of friends and family—many of which he developed in his at-home darkroom. Confessions of a Photo Freak, my photography blog, is my way to honor him. I think he’d like it. Currently, Rhonda Hall has a full time career as a Program Administrator for a Psychiatry residency program (for medical doctors who want to become psychiatrists). But beneath her normal business babe blazer, she wears a sequined t-shirt that proudly proclaims her super power: Photo Freak! Well, not really, but then, how do we know she doesn’t? Hm? Growing up, Rhonda got interested in photography from her dad’s hobby. In high school, she signed up for a journalism class to learn more about how to capture life’s moments. But her class schedule changed and she ended up in band, instead. Nevertheless, she found a way to keep learning. Over the years I always found myself with a camera, more notably the disposable cameras that required developing at your local drug store. My go-to store was Walgreen’s. From there I would purchase my very first point-and-shoot camera—a pink Sony Cybershot—in 2007. Then, in 2011 I bought my first Canon Rebel DSLR camera following the birth of my daughter. For the next two years Rhonda loved photographing her little daughter and all of her milestones. Then life and time intruded and the camera was put away for a while. Rhonda’s fascination with light and shadow grew, and in 2018 she was inspired to start a photography blog. Within a few weeks, the blog had a name – Confessions of a Photo Freak. The domain was purchased and she began designing her new site. Shortly after, Rhonda’s father became ill, so she put her blog on the back burner to dedicate time to caring for him. He passed on Dec. 14, 2018. I sat at my kitchen table on the morning of New Year’s Eve and suddenly I remembered that I wanted to start a blog. For hours I sat at the table, trying to decide on a topic for my first post. And then it hit me — “Duh, Rhonda…talk about your dad,” so that’s what I did. I dedicated my site and first blog entry to my dad. Rhonda is busy transforming a spare room in their house into her studio, and plans to launch her photography business early next year. Meanwhile, follow along with her photography website, especially if you’re in Northern California, in the East Bay area. 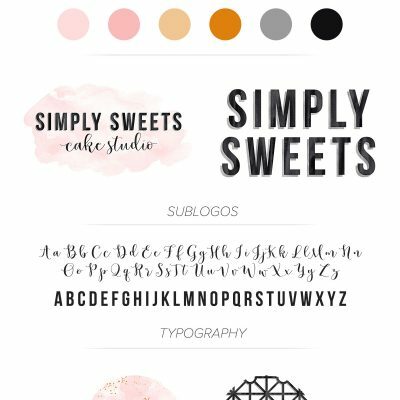 While searching Etsy for premade logos for my brand, I stumbled across Autumn Lane’s branding service. I thought it would be great to have someone create the logo for me (not thinking that I needed to give my input). The overall process was seamless. But finalizing decisions was a bit challenging for me because it was difficult for me to choose just one design! Overall, I am very pleased with their ideas. I believe the design is reflective of my personality and will go well with representing the services I will offer in the future. My future is very bright. This year I will focus on making time to dedicate strictly to my blog. I already have people ready and willing to allow me to practice on them to perfect my craft. I plan to have my home studio set up and ready by Summer. My hope is that I will have paying clients by this time next year. Like other ‘average American adults’, Rhonda’s biggest obstacle has been Time. She’s a wife, mother to active kids (8 years and 13 years old). And she works full time with an hour commute. Thankfully, she has a supportive husband who is pushing her to pursue her dream. He’s committed to make sure that she has the time she needs to dedicate to her dream. When asked about her greatest success so far, Rhonda laughs. I don’t have much to say yet regarding success. But if I had to give an example it would be that I finally stopped making excuses and stepped out of my comfort zone to start making things happen. Follow your dream. I have many regrets about missed opportunities due to lack of confidence or making excuses. I don’t want to look back and regret not following my passion for photography — my Dad’s photos showed me what it looks like to live life in the moment. Practice your craft to help build confidence. It’s easy not to give up when you’re confident in your work. Do you have a dream to someday have your own business and quit your job to build it full time? Why not follow Rhonda’s example, by getting your brand out there to be recognized, prior to launching your company? Maybe you want to do something to honor a family member or a friend. Or maybe you’d just like to update your photography logo like Rhonda! Contact us and we’ll help to make it happen! The heart of Favorite Families is to help families choose each other. To provide practical tools, strategies, support and encouragement to help families become each other’s favorite, to live the values that matter most to them, and to create a legacy for future generations. Rather than try to pick up the pieces after a ‘situation’ (although that does happen), Beth Hoff has a proactive approach to relationships. A passion to help people build strong marriages & families. She holds a Masters in Counseling and is the Director of Marriage & Family for a multi-campus church. But there are times when an appointment with a counselor or pastor isn’t enough. Beth really wanted to provide simple strategies for marriages & families in a broader way, so she started a blog in November of 2018. You’ll find no preachiness or lecturing here. Each post is thoughtful, sometimes fun, always helpful. And best of all – FREE! Posts on Family Culture, Marriage, and Parenting are based on Beth’s own experiences. Start with ‘here’s what happened to me’, read through ‘here’s how I dealt with it’. Then, ‘here’s what I learned from it’. And sometimes, ‘what do you think about it’. Beth writes in the same spirit as if you and she were settled in easy chairs. Picture a crackling fireplace, and enjoying a cup of hot cocoa with mounds of whipped cream. Comfy. Friendly. Caring. If you decide to take action on your own, Beth offers helpful tools like printables, challenges and mini-courses. She’s working on developing a master class to help people shape the culture of their families. That’s set to launch later this year. Besides the Favorite Families website, look for Beth on Facebook and also Instagram. Whatever your preference for connection, Beth has made things easy for you. And she has an ulterior motive. Relax, it’s a good thing. Feel free to give your feedback on Beth’s posts and freebies. Tell her more about what you need the most, right now. Help to influence the digital courses and products she’s planning. Take part in designing practical resources and solutions for marriages and families. Every time you respond about how you were touched, inspired or transformed because of what Beth wrote, that’s a huge success. It motivates Beth to keep moving forward, even though being an entrepreneur can be quite the crazy adventure! I’ve never had a great eye for design, but I know that branding is SO valuable for a business. So one of the first things I did when I started creating my business was to look for help with branding. I happened upon Autumn Lane Paperie through Pinterest and fell in love with the designs! When I saw they offered a basic branding package for a very reasonable price, I jumped on it and I’m SO glad I did. They helped walk me through the process one step at a time, so that it was a lot easier than I thought it would be. Launching my website with a logo and branding has really helped me to get off to a great start. I’ve already had a TON of comments from people about how beautiful my logo is and how they love the colors of my website and it draws them in. ALP made it easy for me to take the general ideas I had in my head and turn them into a gorgeous, specific “brand” that makes me unique. The biggest obstacle to Beth’s own success has been her own fear of failure. Once you get to the point where you are putting yourself out there to the public – your content, your design, your reputation – you feel very vulnerable. The whole process of creating a brand and applying it to different platforms has been a great opportunity for Beth. Taking the risk, she recognizes that she’s offering something that will help bring transformation to people. And even if it’s not perfect, it’s still valuable. As the teacher instructs, so also she learns. (Corollary to ‘as a man thinketh, so is he’.) Beth has come to realize that she can continue to learn and grow as a writer, as a family member, and as a business owner, through each step of the process. You get what you give. Karma. What goes around, comes around. However you describe it, if you’re interested in doing something similar, Beth has some thoughts to share. Get connected with a good community of people doing what you want to do. They have so many great ideas & resources to help speed your process, as well as providing encouragement along the way. Then just put your mind to it and start trying things until you find what works for you and your audience. Getting started with your own professional branding is easy and affordable. Connect with our talented design team and we’ll help to define your perfect business image. On a gloomy winter day, cheer up with sparkly things! Gold and diamonds immediately come to mind, of course. But glitter is a good bridge, and way more adaptable. So now you might want to know where to buy glitter. Glitter Island LLC is the place! Brooke Capps stocks a great many different glitters and is constantly adding more. Just a few examples: happy birthday glitter, glitter shapes and color changing glitter. Check out these cute little autumn leaves! Shop the glitter catalog on Brooke’s website and she’ll ship directly to you. Brooke has always had some kind of business going. She and Matt run a full-service marina on Logan Martin Lake in the Coosa Valley of Alabama, plus a renovation company. Until 2016, Brooke also was an employee elsewhere. But Addie would start school that fall, and Brooke wanted to spend their summers together. So she left her job to be a stay at home mom, and purchased a Silhouette Cameo cutting machine. Crafting and cutting decals and cardstock was fun, but that wasn’t enough. Brooke needed more sparkle in her craft life. So she started searching Facebook for new ideas and came across glitter tumblers. They’re incredibly easy to personalize and fun to create. Plus, they sell like crazy. So for 2 years Brooke made and sold gorgeous glitter tumblers on Etsy and Facebook Marketplace, and still makes them today. Once bitten by the glitter bug, it didn’t take long before Brooke had over 100 different colors of sparkly stuff. After going through the normal customer process of buying and waiting on product, she got the bright idea of selling the glitter herself. So in April of 2018, she started with just 5 different glitters. Immediately it took off. Today, Brooke runs her businesses full time and loves every minute. The store is online only, to allow her to be there for her 6 year old daughter, Addie (who loves helping her mom). At the same time Brooke was preparing to launch Glitter Island, she got in touch with the design team at Autumn Lane Paperie. We had fun on the journey from the first premade logo, through Brooke’s current custom logo, and we think Brooke did, too. The branding process was perfectly smooth. I was a little nervous with it all being online and through email but it couldn’t have gone any better. They were quick to make any changes and answer any questions I had. Most importantly the product is beautiful. I will never use anyone else! Brooke’s biggest obstacle so far has been standing out in a crowd. There are several glitter resellers and some of them have 25,000 members in their groups. So how do you compete with those numbers? Professional branding helps – a lot. Even though Glitter Island is a small group, Brooke is confident that her new branding puts her on an equal footing with the others. Drop in to the Glitter Island group page on Facebook, and see for yourself. And buy some glitter! Feeling the pull to leave the safety of the shore and paddle out on your own? It can be scary, especially when you’re just learning to navigate. We won’t lie to you, there are hidden rocks and sudden storms. But the beauty of a sunrise reflected on the water is incredible! Especially when you can buy glitter and fling it! It’s tough. There are so many different resellers out there now. But don’t give up, and keep pushing forward. Just be real. Customers love that they feel like they can connect with you. I feel like my greatest success is not giving up when things got hard. Running a business is not as easy as it looks! Are you ready to find your own private island? Contact our Autumn Lane design team and let’s share some pineapple! Or maybe even a campfire.